When putting together a sweets table, office party, or any elegant event, nothing beats our tempting varieties of miniature pastries. 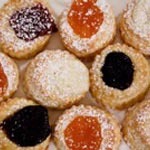 Jarosch Bakery guests can choose everything from mini brownies and cannoli to mousse cups and swans. 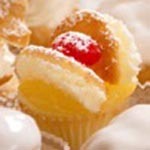 Miniature Pastries should be ordered in advance and can be packaged in boxes or attractively arranged on trays. For the Banana Boats, we slice our petite éclairs in half, fill the half with creamy custard and fresh bananas, and cover the “boat” with whipped cream and walnuts. 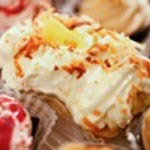 For the Pineapple Boats, we fill the petite éclair half with creamy custard and sweet pineapple chunks, and load the top with fluffy whipped cream and toasted coconut. For the Strawberry Boats, we fill the petite éclair half with creamy custard and fresh strawberry pieces, and ice the top with whipped cream and a small strawberry garnish. You can never have too much chocolate! Our miniature brownie square is filled with pecans & walnuts and topped with rich fudge frosting for a chewy, crunchy, chocolatey bite. Our unique butterflies are petite yellow and devil’s food cupcakes split across the top and filled with either tangy lemon curd or creamy chocolate buttercream. 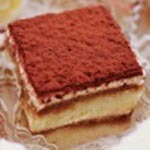 Cannoli Squares: A unique interpretation of a classic pastry. 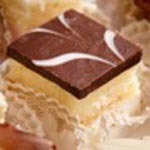 White cake brushed with amaretto syrup, layered with cannoli filling, and topped with a square of marbled chocolate. Lemon Raspberry: Yellow cake layered with tart lemon cream & sweet raspberry preserves. Garnished with a white chocolate square. Mocha: Coffee and chocolate in one bite! Devil’s food cake layered with mocha mousse and topped with a square of marbled white chocolate. 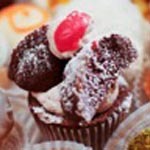 Raspberry Chambord: Reminiscent of a raspberry truffle! Devil’s food cake brushed with Chambord liqueur, layered with raspberry cream, and garnished with a chocolate ganache square. Rum: Enjoy the light caramel flavor of rum! 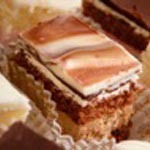 This delicate square consists of yellow cake layered and iced with chocolate rum buttercream and garnished with a drizzled chocolate lattice. Strawberry Mousse: Savor the perfect pairing of white chocolate and strawberry! 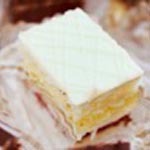 Yellow cake layered with strawberry mousse and finished with a white chocolate ganache square. 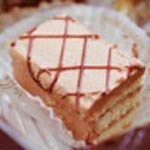 Tiramisu: Yellow cake brushed with coffee & Kahlua syrup and layered with a creamy Mascarpone filling. 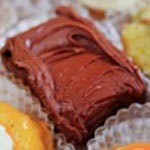 The square is topped with a dusting of cocoa powder. 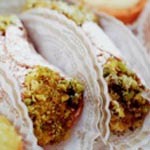 filling with chocolate chips, and your choice of pistachios, chocolate chips, or sprinkles on the ends. These little nuggets of heaven have a cookie cup brimming with creamy, tangy, not-too-sweet baker’s cheese filling and a colored swirl for garnish. 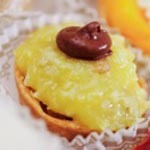 Get a taste of the tropics with these coco-nutty treats! 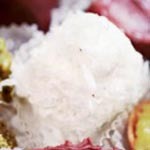 They feature a piece of devil’s food cake rolled in creamy buttercream and covered in shaved coconut. 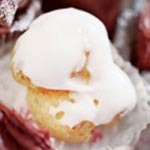 Like our cream puffs, these desserts are made with French pâte à choux dough. We fill them with our homemade custard and garnish them with a touch of melted white fondant icing for a bit of sweetness. 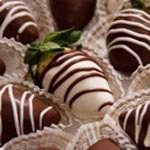 Fresh, juicy strawberries dipped in chocolate or white chocolate. 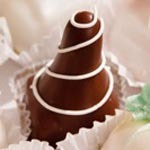 For an extra special touch, we can add drizzle or turn them into tuxedos for a fun and enticing treat on a sweets table. 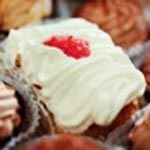 Priced by the pound, minimum of one pound per order. For a tiny twist on a French favorite, try our mini eclairs. 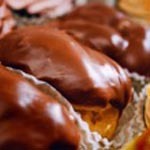 These pastries are made from small, oblong choux pastry that we fill with creamy custard and top with delicious chocolate icing. We use the same cookie base from the cheese & fruit cups, but this time add a generous amount of sweet German chocolate filling, complete with the traditional coconut and pecans. Garnished with a teeny dollop of fudge. Exactly like the large ones, our mini kolacky are made from the same baker’s cheese and yeast dough for a puffy and soft pastry that’s not too sweet. Available in Prune, Raspberry, Apricot, or Cheese. Minimum of 24 per order. 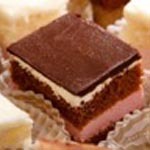 These miniature pastries are a Jarosch Bakery exclusive: a mallow is a small square of tender devil’s food cake topped with a cone of buttercream and coated with chocolate fondant. 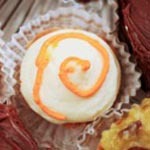 Garnished with a buttercream swirl. Minimum of 24 per order. A favorite among customers and staff, these marvelous mousse bites consist of an edible dark chocolate cup filled with an airy whipped cream mousse, creating a light, somewhat chocolatey dessert. With five flavors, you’ll definitely want to take two! 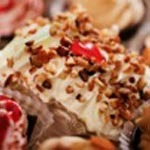 Delightful little cakes perfect for weddings, showers, and birthday tea parties! 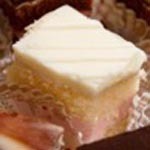 Petit Fours have two layers of firm yet tender white cake with a thin layer of strawberry preserve filling and buttercream. 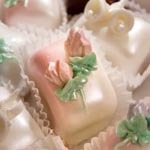 Covered in melted, sweet fondant icing, we can decorate the tops with buttercream rosebuds, booties, and more. Minimum of 24 per order. Taste a work of art! 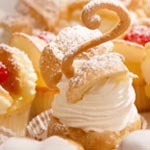 While our swans have the same delicate dough and fluffy whipped cream as the cream puffs, the top is split to resemble wings and we crown each of them with an edible swan’s neck. Swans are a great showpiece for sweet tables and dessert bars.